The breakfast table is a hushed quiet. The sounds of coffee being sipped and porridge bubbling on the stove are the only noises to punctuate the silence. Sa Calobra seemed unthinkable for Harry at the start of the week; but two nights ago he raised it at the dinner table, and perhaps fuelled by a few Belgian beers, he has committed to riding it on his final day. 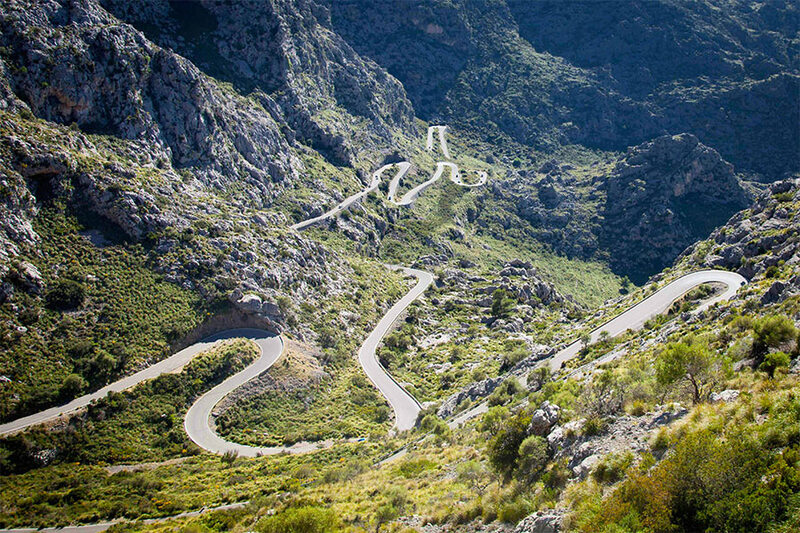 Sa Calobra is a legend of a climb: a 1st category ascent – 9.5 kilometres long, with an average gradient of 7%. The climb’s symbolic 26 hairpin bends, breath-taking views, and spine-tingling descent have captured the hearts of many cyclists; including Tour de France winner Bradley Wiggins. It is a non-stop, all-out effort that lets you completely empty the tank. By the time we reach the top of the Coll dels Reis, where you begin the long descent to the Sa Calobra port (the start of the climb), we have already done 40 kilometres. Harry has been complaining of twinges and niggles, but we reassure him that he will forget all about them in the heat of the climb. By the time we catch up with him, 2 kilometres into the climb, he is beginning to sweat and smile. The effort is showing, but it is hard not to enjoy this beautiful climb. At 5 kilometres in, the view opens out, and you can see back down to the port. It is impressive to see how far you have come; but then you look skywards, and see the 15 plus hairpins that still remain, snaking their way up the hillside. Harry is breathing deeply, sweat dripping from the rim of his cycling cap. His knuckles are white from gripping the bars, and we tell him to relax, and ride at his own pace “you are only racing yourself“. At 6.5 kilometres the tides change. Harry has taken on board our advice, and relaxed into the ride: upping his cadence, and taking the racing line around the apexes. Two-thirds of the way, he is looking incredibly strong. By 8 kilometres, a miracle seems possible: it is a very real possibility that Harry could complete this climb in a sub-hour time. It would be monumental if he did. We pull alongside and let him know; he flashes us a glance, and winks from behind his Oakleys. The end is in sight. We shout encouragement as we ride a few feet behind. Harry hauls himself from his saddle, and pushes the bike forwards as we pass under the stone archway that marks 1 kilometre to go. Summit: 58 minutes, 42 seconds. Incredible. Tears well up as Harry collapses on his handlebars. “I didn’t think I had it in me” he stutters, “thank you so much“. “We knew you did” is our response; “that was an incredible show of going ‘above and beyond“. Time for a celebratory beer!